The 2013 Catherine Lambert Junior Recital Prize Final was held by courtesy of Miranda Francis and John Mitchell of the Royal College of Music Junior Department in the Durrington Room at the College on Sunday 23rd November. The panel of judges, Veronica Veysey-Campbell, Jane Highfield and Nicola-Jane Kemp were unanimous in their awards. The winner of the £300 first prize and the £200 Marian Lines Prize was Clare Sutherland, a student of Tom Marandola at the Purcell School. 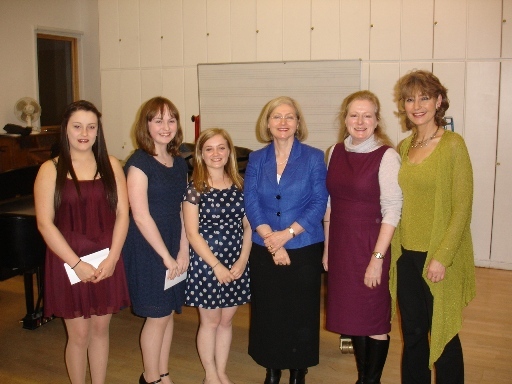 Second was Ella Garner , a student of Liza Hobbs at the Junior Royal College of Music, who won £200. Third, winning £100, was Josie Hawthorn,a student of Sara-Lois Cunningham. Thanks are due to all our sponsors, Catherine Lambert, Coral Gould and Graham Lines and to our indefatigable co-ordinator Carolyn Richards. Left to Right: Josie Hawthorne, Clare Sutherland, Ella Garner, Veronica Veysey-Campbell, Nicola-Jane Kemp and Jane Highfield. This entry was posted in Past Events on November 23, 2013 by AESS.